I remember the first time I heard the “G” word - “globalization.” It was 1985, and I was interviewing a new McKinsey recruit, a former assistant Harvard Business School professor who had decided to exchange the classroom lectern for a larger bank balance. He was about as excited as business intellectuals ever get about the latest HBS paradigm. 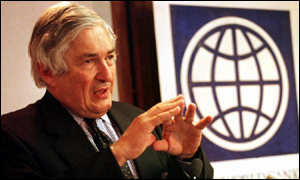 This was the notion that, in the wake of the 1980s debt crisis, countries would soon be forced to “globalize.” According to him, this meant that they would soon dramatically reduce all barriers to trade, investment, and labor migration, so that, over time, the world would become one great big happy marketplace. I reacted with the economist’s usual disdain for business school paradigms. While “globalization” might be a new term, surely the basic concept was not new. For example, the world had also experienced a dramatic rise in trade and investment in the late 19th and early 20th centuries. Nor was it nirvana. As I recalled, this earlier period of free trade been marked by numerous speculative bubbles, debt crises, and even some devastating famines in India, China, and Ireland. Then, during the 1930s, many countries had retreated from the winds of global competition behind tariff barriers, import controls, exchange controls, and fixed exchange rates. At the time these “beggar thy neighbor” policies were damaging to the world recovery. But after the world economy was revived by World War II, it did pretty well during the period from 1950 to 1973. Indeed, many economic historians now refer to that distinctly “un-global” period as the 20th century’s “Golden Era,” the only prolonged period in the 20th century when global growth and income equality have both improved dramatically at the same time. So I could not help but tweak the young professor's nose a bit about the fact that “globalization,” as he called it, was not new, and was evidently neither necessary nor sufficient for strong performance by the world economy. I t is now twenty years later, and many neoliberal pundits are still discussing “globalization” as if it were something strange and new – and as if it did not already have a very long and really quite problematic track record, including its very mixed record since the early 1990s. What should by now be clear to any careful student of the subject is that in fact there really is no such thing as “globalization” per se. Its effects cannot be assessed or even measured apart from specific historical contexts. In other words, the liberalization of trade and investment is never implemented across all markets or trading partners at once. Its impact depends crucially on the precise sequence of deregulation, initial conditions, and on complex interactions with all the other market and regulatory imperfections that remain after specific barriers have been removed. Just to take one specific example – in 1993, Mexico signed the NAFTA, giving its export sector much more access to the US market. However, the gains reaped by Mexican exports have been somewhat disappointing, because it discovered that just as NAFTA was being implemented, China was also dramatically expanding its exports to the US. This was partly just a reflection of China’s lower labor costs. However, for capital intensive sectors, it also reflected China’s artificially lower cost of capital. Unlike Mexico, where the banking sector had been privatized, China’s banking sector remained entirely in state hands, and it provided $billions in subsidized credit to the export companies that Mexico had to compete with. Having liberalized its capital market at the same time that it liberalized trade, Mexico had essentially given up one of its main weapons in its competitive battle with China. The following case study of the global coffee market provides another example of “globalization’s” complex side effects. In the early 1990s, the World Bank and the IMF, which have been two of the most fanatical sponsors and promoters of “globalization” around the world, decided to encourage the Socialist Republic of Vietnam to boost its exports and growth rate by aggressively entering the world coffee market. Millions of poor coffee farmers around the world are still suffering from the effects of this grand strategy. If one is looking for a good example of the unintended impacts of “globalization,” a good place to start is with the world’s second most globalized commodity -- coffee, which is consumed almost everywhere, produced in 70 countries by more than 25 million farmers, and second only to oil as a share of world trade. Coffee has certainly has had its ups and downs in the health literature, although the latest scientific evidence is apparently that, at least in moderation, it can do some good, at least if one is prone to gallstones, asthma attacks, cirrhosis of the liver, headaches, or heart trouble. But it has been undeniably beneficial to the shareholders of leading First-World companies like Nestle, Kraft, Sara Lee, P&G, and Germany’ Tchibo, the giant conglomerates that dominate the international business of roasting, processing, wholesaling, and at least in Starbucks’ case, retailing gourmet coffee to millions of First World customers. In the last decade, all these coffee conglomerates have prospered, and Starbucks, in particular, has struck a veritable gold-mine. Founded in 1985, since its 1992 IPO, Starbuck’s share price has risen at an astounding average rate of 28 percent a year, with four 2-1 stock splits along the way. In February 2004 its market value reached a 12-year high of almost $15 billion, and its revenues now exceed $4.4 billion, growing at 32 percent a year. Entering the vaunted ranks of truly global brands like IBM or Coca-Cola, Starbucks now has more than 74,000 “partners” (actually, employees) and more than 6000 stores in over 30 countries, and it expects to add another 1300 stores this year. Indeed, it is even opening stories in markets that one might have thought would be difficult to crack, like Paris, Saudi Arabia, Mexico, the Philippines, Indonesia, and Lima, Peru, where a cup of Starbucks java reportedly two-thirds of the minimum wage. One might have hoped that the folks at the other end of the pipeline who actually grow all the coffee might have benefited a bit from all this downstream prosperity. But in fact it would actually come as a something of surprise to the world’s 25 million coffee farmers around the globe, most of whom exist at the very bottom of the income distribution in developing countries like Vietnam, Brazil, Nicaragua, Kenya, and Ghana. Even as the processors, roasters, and retailers were cashing in, conditions for these farmers became more fiercely competitive than ever before. Indeed, from 1997 to 2001, composite world coffee prices fell by two-thirds, reaching the lowest levels in 30 years. Since then, average prices have recovered slightly, but they still remain at just half their (real) 1997 levels. Since the demand for coffee beans is price-inelastic, the result was that coffee bean exports and the incomes of coffee farmers all over the world just collapsed. The result was one of the most socially -devastating commodity market crashes in modern history, with millions of poor coffee growers from Mexico’s Chiapas region, Guatemala, and Nicaragua to Kenya and Ghana to Indonesia and Vietnam all suffering the effects. As one of the younger, less diversified companies in the industry with a retail brand to protect, Starbucks was perhaps more sensitive to the growing contrast between its own prosperity and the farmers’ desperate situation. In the late 1990s it responded with a new emphasis on “corporate responsibility.” This included support for “fair trade-certified” and “organic” farming, the implementation of sourcing guidelines that emphasized “sustainable” farming practices, paying premium “fair trade-like” prices above market averages, providing a certain amount of credit to coffee farmers and financial aid to poor farming communities, and other measures. In 2003, for example, Starbucks’ paid an average of $1.20 per pound for its Arabica beans, at a time when the open market price was less than half that much. True, this amounted to just 4-5 cents per cup at most for the farmers, compared with a “vente” coffee based drink that might go for $2.50 to $4.50, depending on what’s in it. True, much of the $1.20 per pound did not get through to the farmers, but was digested by middlemen – even in 2003, at least half of Starbucks’ coffee was purchased through brokers and short-term contracts. True, the 2.1 million pounds of “fair-trade certified” coffee that Starbucks purchased in 2003 amounted to less than 1% of its bean purchases. And true, the social programs and credit that Starbucks distributed to poor coffee farming communities in 2003 amounted to just $1 million and $2.5 million, respectively, scattered across nine countries – less than 1 percent of its operating income that year. But at least Starbucks deserves credit for making an effort, which the other giants in the industry have failed to do. However, if Starbucks had really wanted to assist poor coffee farmers around the world, it would not have wasted time with all the “fair trade” and “green farming” activity, as valuable as these symbolic gestures might be in the abstract. As the following tale explains, Starbucks and the fair traders would have had far more social impact if they had simply persuaded the World Bank to keep its mitts off coffee production. In 2000-2002, an acute coffee market crisis hit poor countries like Nicaragua, Guatemala, and Kenya broadside. The tale of this fiasco is worth telling just because of its dire impact on such countries, which depend on coffee for 25 to 30 percent of their exports. But it is also a striking example of the unintended side-effects of globalization, and of neoliberal development banking at its worst. After all, as noted, coffee is grown by more than 25 million small farmers in more than 50 developing countries, including several of the world’s most heavily-indebted nations. Indeed, it is second only to crude oil as a developing country export. So if you wanted to pick one global commodity market not to screw up, this would be it. But that did not stop the World Bank, the IMF, and the Asian Development Bank from doing so. In 1986, the Socialist Republic of Vietnam’s Communist Party leadership decided to switch from central planning to a liberalization policy called “doi moi” – “change and newness.” This was partly just because, like Cuba, Vietnam could no longer depend on the (crumbling) USSR for huge subsidies. It was also because senior economists at the IMF, UNDP, World Bank, and ADB were preaching the glories of free markets, and holding out the prospect of billions in aid. The resulting program, designed with extensive assistance from the world’s leading development banks, was a controlled version of a standard orthodox adjustment program. It set out a 10-year plan – oops, “strategy” - for export-led growth, based on opening up Vietnam’s heretofore-closed economy to trade and investment, allowing state-owned banks freedom to lend to individual borrowers, decollectivizing the farm sector, and – in particular -- encouraging small farmers and state-owned companies to develop new cash crops for export. At the same time, political power was to be kept firmly in the hands of the Communist Party’s Politburo. Despite that slightly-illiberal grace note, from 1993 on, this doi moi economic liberalization package was generously supported with plenty of advice and more than $2 billion a year of foreign loans and grants from the Asian Development Bank, the UNDP, Japan’s JIBC, the France’s Development Fund (AFD), the World Bank, the IMF, and the aid agencies of the US, Sweden, France, and several other Western governments. Nicaragua’s 44,000 small coffee farmers, the 6 million small farmers in 49 other countries who collectively produced more than 80 percent of the world’s coffee beans, and the more than 100 million people whose jobs and livelihoods depended on coffee beans, had probably never heard of doi moi. But they became one of its first targets. Right from the start, evidently without much thought about collateral damage, Vietnam and its neoliberal wizards decided to embark on a brave new coffee export business. While coffee had been grown in Vietnam ever since the 1850s, production and exports had been limited. The domestic market was small, and there were few facilities to process the raw beans. As of 1990, green bean exports were a mere 1.2 million 60-kilo bags per year. But Vietnam’s central highlands did have rich hilly, lots of rainfall, and low labor costs, which were ideal conditions for achieving high yields and low prices. This was especially true for low-grade, easy-to-grow robusta beans. From a consumer’s standpoint, this species was inferior to the Arabica beans grown by Nicaragua and most other Central American producers, as well as big producers like Brazil and Colombia. Arabica had traditionally accounted for more than three-fourths of the world’s coffee production. But robusta had twice the caffeine content of Arabica at half the price, and it could also be used as a cheap filler and blending ingredient. By the 1990s, bean quality was no longer an absolute barrier to entry in coffee farming. The global market was increasingly dominated by a handful of giant First World coffee processors, roasters, and grinders, including Nestle, Kraft, Sara Lee, P&G, and the German company Tchibo, as well as retail store owners like Starbucks, which generated their own blends. Increasingly, these companies sourced coffee beans from all over the planet, mixing and matching them to produce blends that not only satisfied customer tastes, but also minimized costs. These global buyers had been working overtime on new technologies that took the edge off the cheaper robusta beans and allowed them to be used for extra punch and fill. With the help of commodity exchanges, the giants had also defined standardized forward and futures contracts that allowed them to hedge against price fluctuations – making for a much more “perfect” global coffee market. From the standpoint of small farmers, most of whom did not have easy access to such hedging devices, “market perfection” was in the eyes of the beholder. The changes introduced by the giant buyers amounted to a radical commoditization of the market that they depended upon for their livelihoods, a sharp increase in direct competition. Accordingly, even as downstream market power became more and more concentrated in the hands of the First World giants, the farmers’ share of value-added plummeted. In 1984, for example, raw coffee beans accounted for more than 64 percent of value-added in the US retail coffee market. By 2000, this share had dropped to 18 percent. From 1990 to 2000, while global retail coffee revenues increased from $30 billion to $60 billion, the revenues earned by bean-growing countries dropped from $10 billion to $6 billion. By then, for every $3.50 café latte sold by Starbucks, the farmers earned just 3.5 cents. The farmers’ shrinking role was due in part to the basic structure of the global coffee industry. On the supply side, as noted, by the 1990s, raw beans were being exported by more than fifty countries, who were competing head-to-head. But while a few growers like Brazil and Colombia had tried to break into foreign markets with their own processed brands, a handful of global First World buyers still dominated processing and marketing. Indeed, many of the world’s leading exporters of processed coffee, like Germany and Italy, grew no coffee at all. This long-standing First World control over global coffee processing is partly due to technical factors. There are economies of scale in processing, but not in coffee farming. Unlike petroleum or natural gas, which can be warehoused for free in the ground, coffee beans are costly to store. Unlike wine, aged beans also have no incremental value. Furthermore, most small coffee farmers depend on coffee sales for their current incomes. Global coffee demand is actually not very price-sensitive, and it is only growing at a modest 1 percent per year. All this means that prices tend to fluctuate wildly with current production, so there is an incentive for processors to stay out of farming, shifting market risks to millions of poorly-diversified producers. The fact that coffee beans be stored 1-2 years, while roasted or ground products have a much shorter shelf-life, also favors locating processing facilities close to the final consumer markets. And anyone who has been to France, Italy, or Brazil knows that tastes for particular kinds of coffee vary significantly across countries. But the coffee industry’s international division of labor is not only based on such technical factors, many of which are actually declining in importance. It is also based on long-standing trading patterns and colonial relations – for example, the 16th century role of the Dutch in smuggling coffee plants out of Yemen to their colony in Java, which fostered Indonesia’s entire coffee industry; the role of French, British, Portuguese, and Japanese trading companies in Africa, Jamaica, Guyana, Brazil, and Asia, and the role of American companies in Colombia, Central America, and Southeast Asia. The First World’s dominance has been reinforced by trade barriers that favor the importation of raw beans over processed coffee. The net result of all this is as if France, Italy and California were compelled to export all their grapes to Managua, Nairobi, and Jakarta, in order to have them processed into wine. Along these lines, given the importance of small coffee farmers to debtor countries, and the World Bank’s supposed commitment to “poverty alleviation,” it may seem surprising that the World Bank, the IMF, and other development lenders devoted zero energy in the 1990s to designing a monopsony-breaking strategy for coffee growing countries, to help them break down this division of labor its supporting trade barriers. Instead, the development bankers did just the opposite, helping Vietnam implement an anti-producer-cartel strategy that ultimately helped to drive the coffee- countries’ association, a rather pale imitation of OPEC, completely out of business in 2001. Could it be that these First World development banks were not influenced by the fact that the world’s leading coffee conglomerates also happen to be based in countries like the US, Japan, France, Switzerland, and Germany, not far from the development banks’ headquarters? Vietnam’s decision to push coffee bean exports as a cash generator in the 1990s was not just based on rational economics. Like most critical decisions in economic development, it also had a crucial political motive. Vietnam’s best region for growing coffee turns out to be the Central Highlands, along the border with Cambodia and Laos. This region is inhabited by about 4 million people, including 500,000 to 1 million members of non-Buddhist ethnic minorities who are known collectively as the Montagnard/Dega hill tribes. These fiercely independent peoples have battled the Communist Party, and, in fact, most other central authorities, for as long as anyone can remember. In the 1960s, 18,000 of them joined the CIA’s Village Defense Units and fought hard against the NLF. They had many run-ins with South Vietnam’s various dictators. After the war ended in 1975, some Montagnard tribes continued armed resistance at least until the late 1980s. The result was an influx of up to 3 million people to the Central Highlands provinces in less than two decades. In 1990-94 alone, some 300,000 new migrants arrived in the provinces of Dak Lak, Lam Dong, Gia Lai, and Kontum, looking for land. By 2000, these four provinces alone accounted for 85 percent of Vietnam’s coffee production. This reduced the Montagnard tribes to the status of a minority group in their own homelands. They watched in anguish as their ancestral lands were reassigned to outsiders, including state-owned companies, controlled by influential Party members in Hanoi who had close ties with leading Japanese, American, and Singaporean coffee trading companies. Many Montagnards were forced to resettle on smaller plots, without compensation. Over time, as the local economy became more vulnerable to fluctuations in world coffee prices, this contributed to explosive social conflicts. From the standpoint of Nicaragua’s campesinos, the key impact of all this was on world coffee prices. In Vietnam, the migrants and Montagnards alike turned to coffee for support on increasingly-crowded plots. At the time, in the early 1990s, coffee still offered greater revenue per unit of land, compared with other cash crops like rice or peppers, and it was also being actively promoted as a cash crop by state banks, trading companies, and the government. It took three to four years for a new coffee bush to mature, so the real surge in exports did not occur until 1996-2000. Then, in just a four-year period, Vietnamese exports flooded the market. From 1990 to 2002, they increased more than ten-fold, from 1.2 million 60-kilo bags to more than 13.5 million bags. By 2000, Vietnam had become the world’s second largest coffee producer, second only to Brazil and ahead of Colombia. In the crucial market segment of cut-rate green robusta beans, the blenders’ choice, Vietnam had become the world leader. While other producers like Brazil also increased their robusta exports during this period, Vietnam alone accounted for more than half of all the increased exports. This helped to boost robusta’s share of all coffee exports to 40 percent. In pursuing this strategy, Vietnam did not bother to join coffee’s OPEC, the Association of Coffee Producing Counties. Indeed, it acted rather like a scab, providing an incremental 800,000 metric tons of low-priced coffee by 2000, roughly equal to the world market’s overall surplus. The giant coffee buyers were quite happy to buy up all this low-priced coffee and swap it into blended products like “Maxwell House” and “Tasters’ Choice,” using it to discipline other leading supplier-countries. At the same time, foreign debt-ridden countries like Indonesia, Brazil, Uganda, Peru and Guatemala also boosted their coffee sales, in order to generate more exports. In September 2001, partly because of this beggar-thy-neighbor strategy, the ACPC completely collapsed and was disbanded. The resulting export glut caused world coffee prices to tumble to a 33-year low by 2002. According to the World Bank’s own estimates, this caused the loss of at least 600,000 jobs in Central America alone, and left more than 700,000 people in the region near starvation. Worldwide, the effects of the coffee glut were even more catastrophic, because the world’s fifty-odd coffee producing countries included many of the world’s poorest, most debt-ridden nations. Ironically, just as they were supporting Vietnam’s rapid expansion into exports like coffee, in 1996 the World Bank and the IMF had launched a new program to provide debt relief to the world’s most “heavily-indebted poor countries” -- the so-called HIPC program. By 2001, indeed, the HIPC program had made some progress in debt reduction, cutting the “present value” of the foreign debts for those countries that completed the program by a median of thirty percent. However, of the 28 heavily-indebted poor countries that had signed up for the World Bank’s HIPC program by 2003, no less than 18 of them were coffee growing countries – including not only Nicaragua, but also desperately poor places like Bolivia, Honduras, Uganda, the Congo, Cameroon, Rwanda, the Ivory Coast, and Tanzania. Indeed, for the larger coffee exporters in this group, even when they managed to wend their way through HIPC’s complex program and qualify for debt relief, they found that most of its benefits had been offset by the coffee crisis! For example, Uganda, the very first country to qualify for HIPC relief, discovered that by 2001, just one year after qualifying for HIPC, its foreign debt was higher than ever -- mainly because it had to borrow abroad to offset the impact of the coffee crisis on exports! Furthermore, many other “not-quite-so-heavily indebted” developing countries that produced coffee, like India, Indonesia, Peru, Guatemala, Kenya, Mexico, and El Salvador, were also hurt badly. Overall, if one had set out to create destitution and suffering in as many of the world’s developing countries as possible at one fell swoop, one could hardly have devised a better strategy than to encourage Vietnam to thoughtlessly expand its commodity exports in general, and coffee in particular – free markets be blessed, all other developing countries be damned. In Nicaragua’s case, the average wholesale price for its Arabica beans fell from $1.44 a pound in 1999 to $.51 cents a pound in 2001 and less than $.40 a year later, compared with typical production costs of $.83 a pound. Among the hardest hit were Nicaragua’s 44,000 small producers, who accounted for two-thirds of Nicaragua’s production and provided jobs that supported another 400,0000 Nicaraguans, most of them landless campesinos in the rural northwest around Matagalpa, north of Managua. They depended upon Nicaragua’s annual coffee harvests for most of their employment and income. The resulting crisis in the countryside set off a migration to Managua and other cities, with thousands of hungry, landless people crowding into makeshift shacks on the edge of town. Obviously all these developments begged many questions so far as the role of the World Bank and Vietnams’ other international lenders and advisors was concerned. After all, Vietnam was just a very poor state-socialist country that was undertaking all these free-market reforms for the first time – after fighting and winning a thirty-years war of its own with the US. The World Bank, IMF, and the ADB, on the other hand, were supposed to be the experts – they had implemented such reforms all over the world, backed by billions in loans and boatloads of Ivy-League economists. And Vietnam was intended to be one of their poster stories for de-socialization, and for the claim that growth, free markets, and “poverty alleviation” could go hand-in-hand. In April 2002, sensitive to NGO charges that the World Bank and the other development lenders might actually bear some responsibility for this fiasco, the World Bank went out of its way to issue a press release denying any responsibility for the crisis whatsoever. Or more precisely, it denied having directly provided any financing to expand coffee production in Vietnam. It also maintained that its $1.1 billion of lending to Vietnam since 1996 had tried – though evidently without much success – to diversify farmers away from cyclical crops like coffee. It also argued that, after all, its lending to Vietnam’s rural sector had only started up after 1996, while coffee production had increased since 1994, and that none of its investments had been “designed to promote coffee production. (emphasis added) ” It did identify two World Bank projects that “could be linked” to coffee production – a 1996 Rural Finance Project that helped Vietnamese banks lend money to farmers, and a Agricultural Diversification Project. But for these projects, the Bank simply observed that it didn’t dictate how Vietnamese banks re-loaned the funds that it had loaned to them. Overall, then, World Bank basically washed its hands of the coffee crisis -- one of the worst disasters to strike small farmers, their dependents, and debtor countries in modern times. The World Bank did assure the public that it was extremely concerned about the plight of these farmers, and promised to address their woes. On closer inspection, this defense had more than a few holes. First, whether or not the Bank financed any new coffee farms, clearly the World Bank and its cousins at the IMF, the UNDP, and the ADB were up to their elbows in designing, managing, and financing Vietnam’s economic liberalization program. In the first place, they played a key role in pushing Vietnam to liberalize trade, exchange rates, and banking quickly. To set targets for Vietnam’s macroeconomic plans, they had to have known which export markets the government planned to go after. After all, coffee was not just another export. After the removal of Vietnam’s quotas on coffee and other exports in 1990, partly at the request of IMF, coffee quickly became the country’s number-two export, second only to oil. It continued to be one of the top ten exports even after prices cratered. The ADB and the World Bank also worked closely with Vietnam’s Rural Development Bank, the country’s largest rural lender, to improve management and structure new lending programs. They also advised Vietnam on how to set up a Land Registry, so that rival land claims could be settled and farms – at least the non-Montagnard claimants who found it easier to get titles -- could borrow to finance their new crops more easily. Vietnam has become a successful (coffee) producer. In general, we consider it to be a huge success...It is a continuous process. It occurs in all countries - the more efficient, lower cost producers expand their production, and the higher cost, less efficient producers decide that it is no longer what they want to do. So, despite its 2002 press release, the World Bank’s true attitude about this whole fiasco appears to have been a combination of “not my problem,” sauve qui peut, and Social Darwinism. Meanwhile, back in Vietnam, the small farmers in the Central Highlands learned the hard way about the glories of global capitalism – thousands of them had decided that it was “no longer what they wanted to do,” but were finding few easy ways out. After the 1999-2002 plunge in coffee prices, Vietnam’s export earnings from coffee fell by 75 percent from their level in 1998-99, to just $260 million in 2001-02. In 2002-03, they fell another 30 percent. In the Central Highlands, thousands of the small farmers – low-lenders and Montagnards alike -- had gone deeply into debt to finance their growth, and were struggling to feed their families and send their children to school, because market prices now covered just 60 percent of their production costs. In short, ten thousand miles from Managua, on the opposite side of the globe, these highland farmers were facing the same bitter truths that Nicaraguan campesinos were facing -- that they had more in common with each other than with the stone-hearted elites who governed their respective societies, and designed futures that did not necessarily include them. 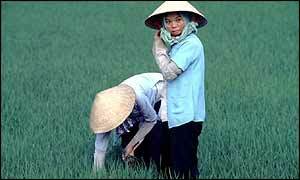 In Vietnam, the resulting economic crisis severely aggravated social and political conflicts in the Central Highlands. In February 2001, several thousand Montagnards held mass demonstrations in Dak Lak, demanding the return of their ancestral lands, an end to evictions for indebtedness, a homeland of their own, and religious freedom ( since many Degas are evangelical Christians). Vietnam responded with a harsh crackdown, sending thousands of elite military troops and riot police to break up their protests. They arrested several hundred of them, and then used torture to elicit confessions and statements of remorse. They also destroyed several local churches where the protestors had been meeting. Those protest leaders who did not manage to escape to Cambodia were given prison sentences up to 12 years. From one angle, this repressive response was the typical handiwork of a Communist dictatorship. From another angle, however, it was just another example of the repressive tactics that neoliberalism required to implement free-market “reforms” by non-Communist regimes, in countries like Venezuela, Ecuador, Bolivia, Egypt, Indonesia, the Philippines, Argentina, and post-FSLN Nicaragua. In Vietnam’s case, far from helping to solved its political problems in the Central Highlands, the Politburo discovered that their neoliberal reforms had inadvertently helped to revive the Dega separatist movement. Evidently, economic and political liberty did not always go hand in hand. At least the Politburo and their foreign advisors did have something to show for the coffee strategy, however. In 2000-2002, the profit margins earned by the five giant companies that dominated the global coffee market were higher than ever. Furthermore, cocaine producers in the Andean region no longer had to worry about small farmers substituting coffee for coca. In Colombia’s traditional coffee-growing regions, just the opposite started to happen in the late 1990s, as many farmers converted coffee fields to coca, in the wake of the coffee glut. Indeed, from 1995 to 2001, coca cultivation more than tripled in Colombia, including a 20 percent increase in 2000-01 alone. This occurred despite hundreds of millions of dollars spent by the USG on coca eradication efforts, the so-called “centerpiece” of its “Plan Colombia.” In 2000-01, coca production started to increase again in Peru, Bolivia, Ecuador and Venezuela. There were also reports that farmers were even turning away from coffee and towards coca in areas that had never before seen coca, like the slopes of Kenya’s Mount Kilimanjaro. Cocaine production from the Andean countries also rose sharply from 1998 to 2002. After all, unlike coffee, at least coca and cocaine were products for which both the farming and the processing could be done at home. Overall, by 2003, Nicaragua’s real per capita income had fallen to $400 (in real $1995), roughly its 1951 level. With population growth averaging 2.4 percent a year in this overwhelmingly Catholic country, the economy would have to grow at 5 percent a year for 30 years just to recover the 1977 per capita income level – compared with the actual average growth rate of 1.3 percent during the 1990s. 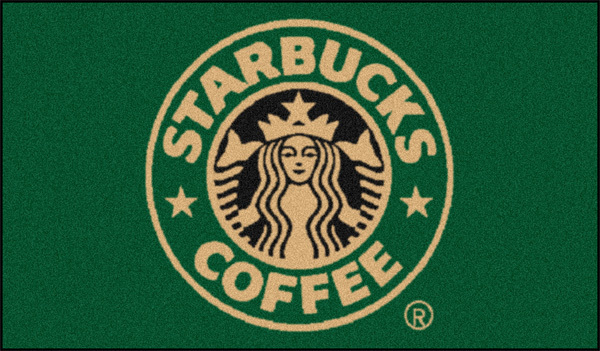 By now, the country’s entire national income is just $11.2 billion, less than three Starbuck’s annual revenues. By 2003, underemployment levels exceeded 60-70 percent in many parts of the country, and the overall proportion of people living in poverty was 67 percent, second only to Honduras in Latin America. This means that there were some 1.6 million more Nicaraguans living on the borderline of existence than in 1990, at the end of the contra war. Earlier, in the 1980s, the Sandinistas had been justifiably proud of their health, education, and literacy programs. Even in the depths of the contra war, rates of infant and maternal mortality, malnutrition, and illiteracy had declined. Infant mortality fell sharply from 120 per 1000 live births in 1979, immunization coverage rose, and the share of the population with access to health care increased from 43 percent to 80 percent. In the 1990s, however, there were sharp increases in all these maladies, aided a 75 percent cut in public health and education spending by 1994. By 2000, Nicaragua was spending four times as much on debt service as on education, and a third more than on public health. The infant mortality rate was still 37 per 1000, and the under-age-five mortality rate was 45 per thousand, among the highest in Latin America. (Cuba’s equivalent rates, for comparison, were 7 and 9 per thousand.) As of 2000, 12 percent of Nicaraguan children were underweight, and 25 percent were under height. More than 22 percent of children under the age of 9 – 300,000 children -- were malnourished. By 2000, 37 percent of school-age children were not enrolled in classes, and illiteracy, which an intense campaign by the Sandinistas in 1980-81 had reduced to 15 percent, had climbed back up to 34 percent, and was even higher in rural areas. Women’s rights also suffered, as the Church conspired with the new conservative governments to drive abortion underground, even at the cost of higher maternal mortality rates because of botched illegal abortions. Coincidently, Nicaragua’s $400 per capita income was almost exactly the same as that of the Socialist Republic of Vietnam, its new direct competitor on the other side of the planet. Indeed, in one of history’s many ironies, these two formerly “leftist” countries were now passing each other on the globalization escalator, heading in opposite directions. By 1998, if we believe the statistics published by the UNDP, Vietnam’s poverty rate had dropped to 37 percent, below Nicaragua’s, while adult literacy had reached 94 percent, above Nicaragua’s (declining) rate of 63 percent. Vietnam’s average life expectancy had also matched Nicaragua’s 68.3 years. And far from having a chronic foreign debt crisis, which Nicaragua has had since 1979, Vietnam became one of the development banks’ darlings, as we saw earlier, drawing down $2 billion a year in concessional finance throughout the decade, plus more than $30 billion in foreign investment. Yet Vietnam’s ratio of debt to national income was just 35 percent – not exactly low, but only one-tenth that of Nicaragua’s. Furthermore, with all the outside help, on top of its entry into the coffee export market, Vietnam’s growth rate averaged more than 9 percent a year in the 1990s, even as Nicaragua’s growth stagnated. In 2001, when Vietnam’s Ninth Communist Party Congress adopted its “Tenth Ten Year Strategy” for the period 2001-10, the World Bank and the IMF were both on hand in Hanoi to celebrate with yet another generous structural adjustment loan program – carefully shielded, of course, from any angry Montagnards who might wish to complain. All told, by the New Millennium, out of 173 nations ranked by the UNDP according to their “human development” metrics, by the year 2000, Nicaragua had dropped from 68th in 1980 to 118th. It passed Vietnam on the way down, which was in 101st place and rising. The responsibility for Nicaragua’s decline appears to have been almost evenly divided between the contra war of the 1980s and the neoliberal war of the 1990s. Relative to more prosperous (haven) neighbors like Panama and Costa Rica, as well as to the pro-US, military-dominated abattoirs to the north, Guatemala and El Salvador, Nicaragua’s relative decline has been even more striking. © James S. Henry, SubmergingMarkets™, 2004. All rights reserved. No reproduction without express consent of the author.